• الموضوع : mohamad el husseini: The responsibility of Clerics is reform, guide people and quell sedition . 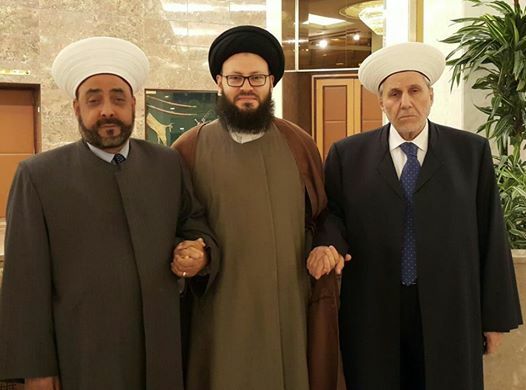 Cleric Mr. Mohamad Ali El-Husseini, Secretary-General of the Arab Muslim Council during his meeting, in Riyadh, with the esteemed Clerics Mufti Tripoli city Sheikh Malek Al-Shaar and The Head of the Center for Studies and Media Sheikh Khaldoun Al-Aerymt, confirmed that if Clerics met all people will unite and if they separate people will fight; because the responsibility of Clerics is to reform, quell sedition, guide people and direct them towards goodness, love, live in tolerance, moderation and stay away from extremism and fanaticism. #ElHusseini added that this role is needed today more than ever because The Islamic Nation is exposed to external malicious attacks targeting to undermine its unity, trying to tear it apart into groups and sects, and bring dispute between the sons of one sect. There is no way but to face this except in straitening queues and leave controversies aside. Mr. El-Husseini stressed that "the real Clerics stand at the forefront of defenders of Muslims’ unity." He concluded: This is the basic Clerics job, and within the approved telling of God’s Messenger (p.): "If the Cleric is virtuous the world will be righteous and if he messes up the world will mess up."